Love Calculator Created by AppsBee. This templates have specific characteristics, namely: Love calculator is a fun application where friends and couples can calculate the percentage of love between them.Two special scanners, scans the fingers one by one than love calculator gives random love percentage.The design of the application is very elegant and supports all screen sizes and works . 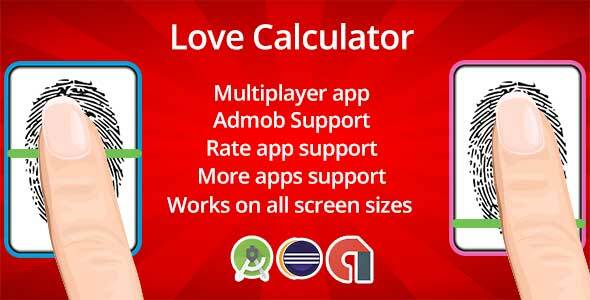 You can use this Love Calculator on Mobile category for android, calculator, fingerprint, love, lovemeter, lovescanner, meter and another uses. 1: Android Studio + Eclipse full source code. 2: Admob Integrated (Banners + Interstitial). 4: Display names with love percentage.